I have a passion for travel, whether in my region or country, or the vastness of our planet. An enormous thrill to travel to the Pacific and all her islands: Tahiti (and Moorea…not Moria), Bora Bora, Fiji, Tonga, the Solomon Islands, the Samoa Islands (all on the top of the list), all of Polynesia, Micronesia, and Melanesia – if I could I would visit every island. If I could choose which to visit first, I want to go to Tahiti most. I’ve had different Tahitian punches, some were good, but some were not so good, instead tasting ordinary, like any rum would replace another, and the same with juices. The Tahitian Punch does not have a fill-in-the-blank recipe, and deserves respect. I was thinking about writing about a few recipes, sort of like a taste test type of thing, but decided against it after I bought the last ingredient in the recipe below. I finally got my hands on Coruba rum. If you are unfamiliar with honey cream, it is easy to make, but has a ticking clock attached to it. If it cools too much, it will harden, and shatter when shaken with ice, then float…an understandably undesirable result, and causing an emotional response when looking down into the glass – precisely the opposite effect you want when looking at your drink. The goal is creaminess, a taste sensation of both flavor and texture. You want to control the butter, making it work for you, and in the end an enjoyable instrument for the drink. Boiling butter is not the goal either, as it will separate on itself. Simply warm the three together in a microwave, slowly, or if you prefer in a small pan on the stove, just as long as there’s not too much heat. So you’ll need to make this just a little before shake time. Papa Jules cooks his honey cream every night at his Mahiki nightclub in London. His recipe is equal parts butter (no salt kind), honey and brown sugar. And in case you don’t want to hunt down the definition, Toere means “drum” in the Tahitian language, and I’ve heard it is pronounced “toe-eddy”. If that is correct, it seems reasonable with the “rolling R” mechanic, and perhaps a percussive quality. One last thing, I floated orange juice, not an overproof rum, nor a dark rum – but juice. I have never heard of anyone doing this, and probably am “doing it wrong” by choosing this technique. In my defense, I chose orange juice as a garnish, not a mixed ingredient, mostly for the scent of smell. In many Tahitian Punch recipes with orange juice as an ingredient, this time I did not want an orange flavor, but its aroma…that is if orange juice truly defines this specific punch. Chill double old-fashioned glass. Season the interior surface of the glass with Maraschino, then discard. Shake rest of ingredients with crushed ice. Pour unstrained into glass. Float orange juice. Garnish with spent orange wedge and a lime wedge (pineapple too, but I didn’t have any at the time I made the drink). *Don’s Mix: 2 parts grapefruit juice with a half part cinnamon infused simple syrup..
**Jules’ Honey Cream: Equal parts butter, honey and brown sugar. 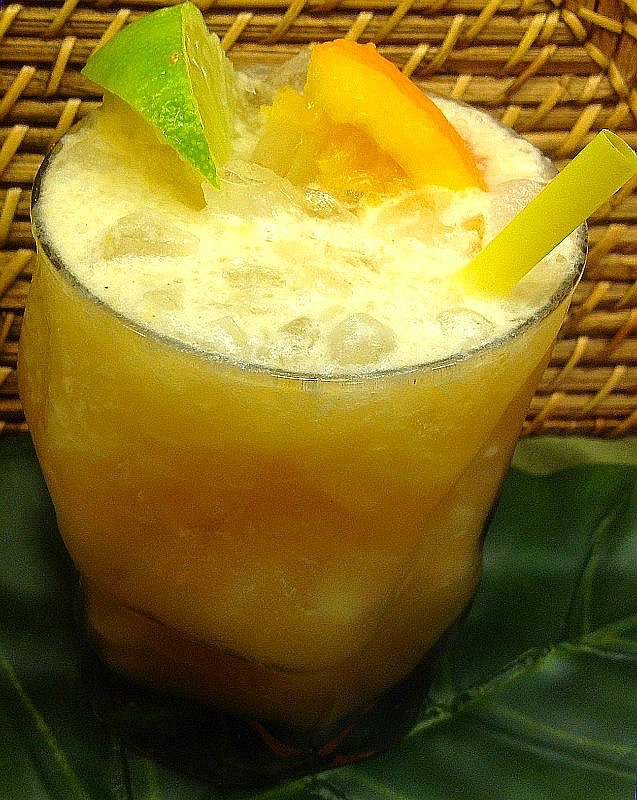 This entry was posted in Toere and tagged Bora Bora, Coruba, demerara rum, Don's mix, El Dorado rum, Fiji, Hawaii, Honey, honey cream, Maraschino, Melanesia, Micronesia, Pacific Ocean, Papa Jules, passionfruit juice, Peychaud's bitters, pineapple juice, Polynesia, Samoan Islands, Tahiti, Tonga by Jack. Bookmark the permalink.